There is no way to guarantee that you won’t have a flat. As well, you can’t be 100% always saved from damage when a blowout/flat occurs. These things happen, but you can do a few things to help hedge your bets on the side of no flats or less catastrophic consequences. First and foremost, regularly inspect your tires (checking their age, looking for cracking, and looking for obvious issues). Secondly revolves around maintaining proper tire pressure. 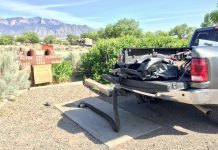 Honestly, the RV Tire Safety blog has a great post on this. The long and short of it is, you’re looking at the tread, sidewall, and they touch on how to do a “free spin” check for tread/belt separation. Additionally, I’ll add that you should be verifying the date of the tires as most trailer tires age out long before any other issues. The first school is that you should check tire pressure in the morning before departing. 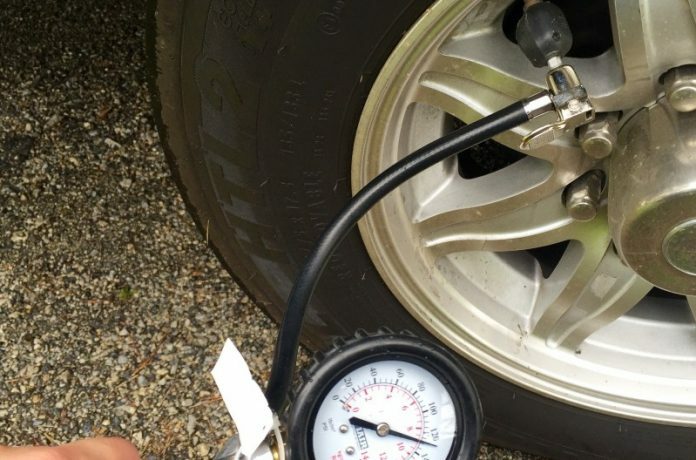 Your tires should be “cold” and you should verify that the pressure is at the maximum pressure indicated on the tire placard on the side of your camper OR on the sidewall of the tire. This is good but it isn’t perfect. This can be hard to have the self-discipline to force yourself to do it. 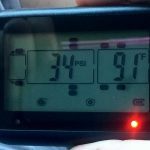 I know that we’re often rushing to get out of the door and checking tire pressure can be an easy one to bump down the list. Changes can and do occur from the time you check the tire’s pressure to when you’re rolling down the road. The very best answer to this is continuous and constant monitoring while you’re underway. Remember, checking tire pressure is only good if you have a means for pushing air into the tire. 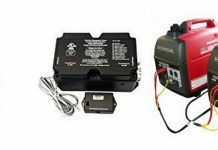 Gas stations and other public air compressors are usually inconvenient when towing- here’s a blog post that talks about my excellent Viair 450P air compressor (check it out on Amazon). The second school of thought is to actively and continuously monitor your tire pressure. 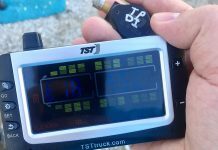 This is done with a set of hardware called a Tire Pressure Monitoring System (TPMS). Many car and truck manufacturers include these from the factory- it makes good sense. Alert the driver that there is the potential for a problem and let them deal with it. However, they are very rudimentary and only tell you that 1 of 4 tires have a problem, not which one nor how low; plus they don’t monitor trailer tires. Most systems monitor most up to 22 tires. It monitors both pressure and temperature. You can program PSI upper- and lower- limits for individual tires. When an alarm occurs, it tells you which tire and what the error is (high, low, temperature). The other side of a TPMS is that it lets you start to see anomalies in individual tires. 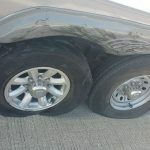 I was able to see symptoms that indicated a tire failure was coming- it showed that one tire of the 10 was acting different as we got up to speed (it had a quicker/higher jump of tire pressure and temperature vs. the others). Unfortunately, I ignored the warning signs and ended up with a flat along side of the road. Shame on me, not the tool. 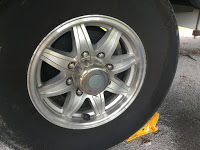 Obviously TPMS systems won’t protect your against every situation, but for me- it’s helpful enough to warn me of issues that are forming, quick warning that an issue occurred, and helps me quickly check tire pressure when I’m getting ready to go. In fact, I can tell you a “good news” story of my flat that occurred in Indiana. Firstly, see above and read about how it should not have happened. Second, when I did get the flat, it told me almost instantly and I pulled over before the tire completely lost pressure. The tire didn’t have time to come to pieces and no damage occurred. There are quite a few TMPS makers and products on the market. Like many things, each one has good reviews and bad reviews. I ultimately chose the Truck System Technologies (TST). I felt that it got the best reviews and liked the “flow through sensors” so that I don’t have to remove them when I top up air in my tires. That said, I have friends who use the EEZTire system and are happy with it. 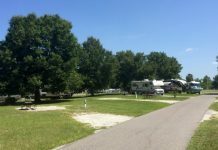 Going back to the RV Tire Safety Blog, they have a post on What is the “BEST” TPMS? that gives a good list of features to look for when evaluating TMPS systems. For products, they’re sponsored by Tire Tracker which as the TT-500. Pair the monitor + each sensor. Program the monitor for high/low alarm settings for each tire position. Remove valve stem caps on each tire and twist on sensor (optionally twist on locking mechanism for each sensor). Place monitor on dash (it has a battery that seems to last for 20-30 hours of drive time and recharging is a matter of using the supplied car/cigarette plug charger; optionally hard-wire monitor into truck’s 12v system). The initial setup probably took me 20 minutes, but I’m a little slow. Putting them onto each tire is only difficult for inner duals. Cellular, wifi, and networks – OH MY!